After careful planning, drafting, testing, and web writing, your client’s website is finally ready to go live. And when it’s published, your client’s first question is likely to be “When will my website be visible in search results?” Time to leverage some google website optimizer tools. That’s a tricky question to answer, as it depends on a number of factors. Ideally, your customer’s published content will already be SEO optimized. And hopefully, they have a content strategy in place that includes link building and keyword analysis to continue driving traffic. But using these tools for a boost in organic search rankings can take some time, especially when competing with common keywords. Instead of waiting for SEO-friendly content to pay off, you can give your client’s website a free Google kickstart using tools made by none other than the big G itself. If it isn't on Google, it doesn't exist. When it comes to marketing and the effectiveness of a website, there’s nothing more powerful than cold, hard data. And that’s exactly what Google Analytics deliver. Your clients can get a bird’s eye view of what pages people are looking at, the links they click on, devices people use to browse the site, and demographic information, to name a few examples. Your clients can get a bird’s eye view of what pages people are looking at, the links they click on, devices people use to browse the site, and demographic information, to name a few examples. In short, it gives you a representation of the total customer experience so you have a better idea of which website items need tweaking to maximize engagement. To get started with Google Analytics, you must first have a Gmail account (it’s free to sign up for one). Once you have your Gmail account, you can log in to Google Analytics and register your website. Your clients’ customers need to know how and where to find them. Adding your client to Google Maps helps search engines legitimize the business location and allows for easier discovery.Like Google Analytics, you’ll need to log in to your Gmail account to get the API key. To get started, click on Get a Key at the top of your screen. Then, click Create a Project from the dropdown menu. You’ll want to choose a name specific to the website you’re working with (it makes it easier to manage multiple projects). This article gives you more information about: How To integrate Google Maps in your SiteManager project. If your client is in a hurry to get their website found fast, Google’s Webmaster Tools can give it a manual visibility boost. Here you’ll find a free resource library that offers guides and courses on making a website SEO-capable, free support and testing resources, and access to the Search Console, which helps you test your website and content clarity to get better search results. Simply put, Webmaster Tools helps you focus on creating Google-friendly websites. To integrate Google Webmaster Tools, sign in to your Google account and navigate to the webmaster tools feature. Look for the red button and add your URL (sans www). From there, go to the Upgrade Store in your SiteManager and install the Google Verification File (under System Updates). After you publish the account, you can check the Google Search Console to see your newly added property. Voila! – your site can now be officially indexed by Google. 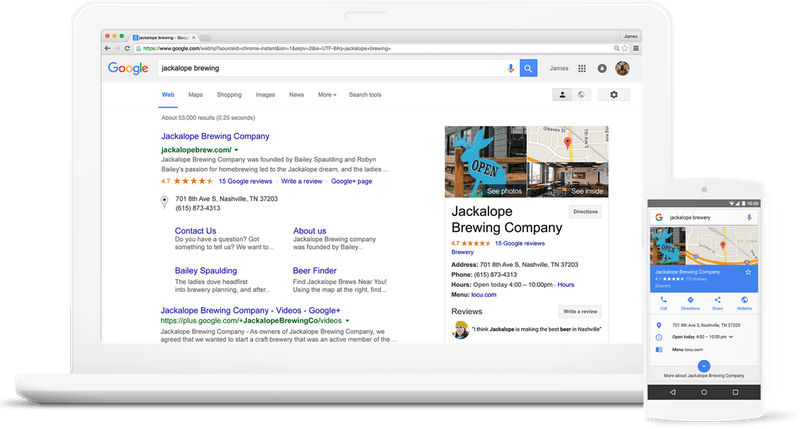 Perhaps one of the most helpful features for customers looking for business info is Google’s free Google My Business feature. Google My Business pages are an essential feature for SEO, particularly in your local market to help nearby customers find your products or services. Your business page can ensure you not only gain visibility in the SERP map alongside other businesses related to the search, but also have a better chance of gaining a spot in Google’s local 3-pack. Business pages can pop up in both organic search and direct search, so it is imperative to maintain current information at all times. Google uses this information to validate the authenticity of a business by comparing it to the same information found on your website, social media pages, and other resources. The more complete and consistent your information is across the web, the better chance you stand of higher rankings. To get started, log in to your Google account and visit Google My Business. Click the green Start Now button in the top right corner and fill out the requested information. That’s it. You don’t always have to spend a lot of money and time to get noticeable results from your website. Google’s suite of free website boosting tools packs enough punch to get the job done well without paying a dime. And when you can save your client money while helping them get their site up and visible more quickly, you’ll gain a customer for life.